I can’t do creepy and scary, but I can do this instead… Happy Halloween. For this photo (without text), and other like it, see the Bella Vu gallery. Happy Halloween from Bella Vu & JapanesePhotos.Asia. It has been reported by various Japanese media outlets that CitiBank Japan was for sale to the highest bidder. Many Japanese banks wanted the Japan subsidiary to acquire the mainly wealthy customers and their money. Tokyo Mitsubishi UFJ (aka MUFG) has apparently been the winner about two weeks ago. This apparently is the final week of business of CitiBank Japan as a CitiBank subsidiary, next week it becomes the property of MUFG. However, CitiBank Japan customers have heard nothing from CitiBank, and all the information they’ve so far received has been via Japanese newspapers. One expat customer asked staff at the Nagoya branch about his accounts. Apparently his ATM and credit cards may not work internationally from next week, which comes at a time when he will be travelling in Taiwan. CitiBank Japan has already ceased over the counter foreign exchange, and it is said that other services will cease this week. The main attraction to CitiBank Japan for expatriate customers was the fact that all services, in branch and on the internet are bilingual and available in English and Japanese. In contrast, MUFG does not provide services for international customers, except for basic ATM functions. MUFG ATMs provide a wider range of functions in Japanese, but not in other languages. This is in contrast to Korea and Taiwan, where I have always been able to use bilingual forms and speak to English speaking staff. MUFG staff refuse to use English, and all forms are in Japanese only, and many essential financial services are refused to people who cannot read Japanese. Consequently, many expats may be looking for friendlier services, as MUFG’s reputation may sour their shiny new acquisition. The little known Shinsei Bank, appears to be the only retail bank that provides English language support left in Nagoya, one of the riches cities in the world. CitiBank Japan was bought by Tokyo Mitsubishi UFJ (MUFG) ahead of uncertainty for account holders. Yes, they still have them, and you too can get a ride in one almost anywhere in the main tourist precincts in central Saigon, District 1. Unfortunately, there are some restrictions on where they can go, but they can get you to all the key central tourist destinations. Here is a great model, Hieu taking a ride past the Ben Thanh Markets, Saigon, Vietnam. More images for licensing can be found on my agent’s website. Hieu taking a ride in a cyclo, in Saigon. 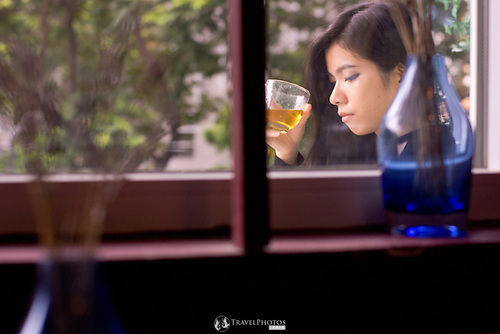 This Photo of the Week (POTW) is of a great model Bella Vu at The Morning Café in Saigon, Vietnam. Whatever you do this week, take the time to enjoy a great drink. Bella Vu at The Morning Café. Photography competition Can I drop your name? Would you mind if I drop your name in a photography competition? The winning criteria is not clear (or stated at all, actually), so I’m not sure if it’s a raffle, or there’s some intelligent selection happening. In short, there is a $5,000 sponsorship for a photo shoot, and a free camera, so a claimed total of $8,000 of prizes for one lucky travel photographer. They want two things. 1. 25 words or less of “Your dream shoot”. 2. A list of email addresses to invite other photographers. I don’t know if the winner will be the one with the best 25 words or less, longest list of invites, the most invites who joined their website and entered, or best 25 words and matching portfolio on their system. Because their winning criteria is not explicit, I’m a little hesitant to just throw people’s names in without checking first. In any case, I’d love to use that money for another trip to Vietnam and get a wider array of great local images of life there, tourism, and more. A young lady in The Morning Café in Saigon, Vietnam. As yet another typhoon approaches (number 18 for 2014), I thought this information might be timely for many people. I’ll keep it brief, mainly because there isn’t that much to say. For current typhoon information see http://www.jma.go.jp/en/typh/. For current and general weather warnings (including snow and other), see http://www.jma.go.jp/en/warn/. For rainfall and radar maps see http://www.jma.go.jp/en/radnowc/. For news, see http://www3.nhk.or.jp/nhkworld/. Typhoons are not that dangerous… any more, at least. If you’re super rich and live in a good neighbourhood in a sturdy house, or like most expats, live in a very sturdy apartment or condominium building, there’s nothing to worry about. Basically it’s just a windy, rainy day, and it has no effect on you, whatsoever. However, if you live in a low-lying area, near canals or rivers, in an area with storm-surge barriers near the sea, then you might have something to worry about (think New Orleans). Furthermore, if you live in Taiwan (with dodgy illegal rooftop structures all around you), or other places with flimsy building construction, then you shouldn’t stay too long near the windows or on your balcony and definitely don’t venture out. In countries like China, Philippines, Taiwan, Vietnam, and others there will be a lot of debris flying about. An office worker with an umbrella walking in a typhoon past a canal that is about to breach, in 2011. He probably was allowed to return home halfway through the day because of a change of JMA advisory. That’s right. Even if your home is at risk, and your family too, you’d better have a good reason not to come into work. Fortunately, most companies allow their employees to either stay home or return home when the Japanese Meteorological Agency (JMA) says that their is a “Warning” level for “storms” (or red on the JMA maps, but listed for “storms”). That means that the slow response the JMA has in updating their websites, and the near server crashes they experience from hundreds of thousands of hopeful employees means that when the information finally comes through, many employees could be in the brunt of the typhoon as they are travelling home. In contrast, Taiwan is much, much more organised. When the government announces closures of government offices either the night before or before 7am on the morning of an expected landfall, all businesses follow suit, so no-one is in harms way unnecessarily. I’ve seen news reports in Japan of children at a school sports day being killed by a marque blowing over in the middle of a typhoon. Japanese do tend to deny nature exists. It is a country of engineers and bureaucrats, not humanitarians. JST: Japan standard time, though the English website quotes everything in UTC (Greenwich Mean Time). Use TimeAndDate.Com Meeting Planner to convert. That’s right, the word “storm” refers to strength of wind, not the normal English definition of violent weather that includes thunder and lighting. One more thing on this point, JMA doesn’t give names to typhoons, but they count them. The one that is bearing down on me as I write this is “number 18 of 2014”, as you can see here, http://www.jma.go.jp/en/typh/141824.html The English version of the website does include the international name of the typhoon. However, all the local news services refer only to the number, not the name. Japanese Meteorological Agency website screenshot from September 2013. Click on your area of the JMA map on their website, and it’ll take you to information for your specific city or region. 4. What is actually dangerous about them in Japan? Some simple facts. The slower the typhoon moves north, the more energy it has. Also the slower it moves, the more rain will pummel the storm area. The more rain in an area, the greater the risk of run-off overwhelming flood barriers, and the greater the risk of land and mud slides in hilly areas. A slow moving typhoon might track between 8 to 15km/h. A faster moving typhoon might move from about 20 to 25km/h. From about 30km/h it seems they start to loose organisation and fall apart. Also, from eye-balling the JMA satellite imagery, if you can easily and very clearly see a large hole in the centre, the eye, then it’s a seriously strong typhoon (see below). In my experience, the central pressure of typhoons is in the 900-1000hPa range. If it drops quickly, that means it’s getting stronger. I think I have seen typhoons under 900hPa, which is seriously strong and quite dangerous. Wind speeds or gusts over 200km/h is considered strong, but speeds over 300km/h are extremely rare and would make international headlines for weeks to come. The most dangerous or wild part of the typhoon is usually the northern arc, not so much the southern for some strange reason. Rainfall of anything over 150mm (I think in a 24hr period) is expected of almost all typhoons, over 200mm is more normal. However, rainfall in the range of 300 to 400mm is a lot. I think rainfall of 50 to 80mm/hr is a lot and expected in the centre of typhoons. Typhoon season in Taiwan is typically in July and August. 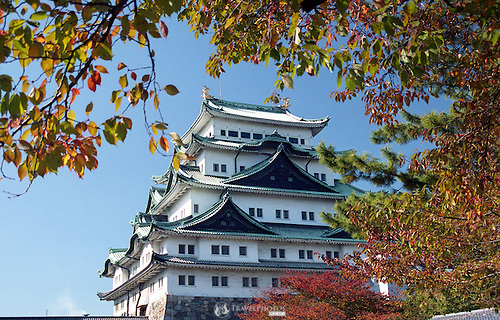 In Japan it is typically in August, but mainly September and October. It’s rare to get one in May, June, or July, but not unheard of. I’ve seen typhoons approach and hit South Korea in August. A satellite image showing a very well formed super typhoon, on 9th October 2014. Usually after a typhoon all the pollution in the skies have been blown away and you’ll see the most amazing blue skies. Also, it’ll be a hot day, too. I’m not entirely sure why. Typhoons tend to follow the warm or hot ocean currents, but warm air or rather, warm days follow typhoons. Expect clear blue skies and very warm or hot days after typhoons have past.